Go all in and play with heart! 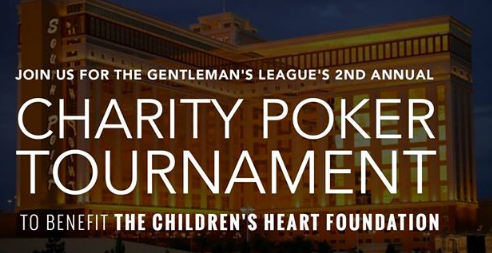 The Gentleman’s League is partnering with Children’s Heart Foundation to shuffle up and deal for their Second Annual Charity Poker Tournament on Saturday, Dec. 8, 2018 at 1 p.m. at the South Point Poker Room in the South Point Casino (9777 S. Las Vegas Blvd.). All proceeds from the tournament will benefit Children’s Heart Foundation. Poker players can play for a variety of prizes including the grand prize of $3,000. Initial buy in is $100 with unlimited re-buys for the first 90 minutes of the tournament. Players will also enjoy a special lunch catered by Buffalo Wild Wings and choice of alcoholic beverages and refreshments with initial buy in. For those players knocked out of the tournament early, they can enjoy a “loser’s lounge” complete with silent auction and raffle. Business sponsorship’s are also available for $250 which includes one player entry. All donations are tax deductible and benefit Children’s Heart Foundation. Research, education and family assistance are at the heart of Children’s Heart Foundation’s mission. In the United States, CHD is 60 times more prevalent than childhood cancer, and nearly twice as many children die each year as die from all forms of childhood cancers combined. Research, still grossly underfunded in the field of pediatric cardiology, is the greatest hope for children living with a CHD a chance to live long, healthy lives due to medical and surgical advances and expert care. It is the hope this event continues to improve the level of care provided to those impacted by CHD. For additional information on participation, please visit www.tgllv.org. RSVPs are also available by calling 702-300-0850.